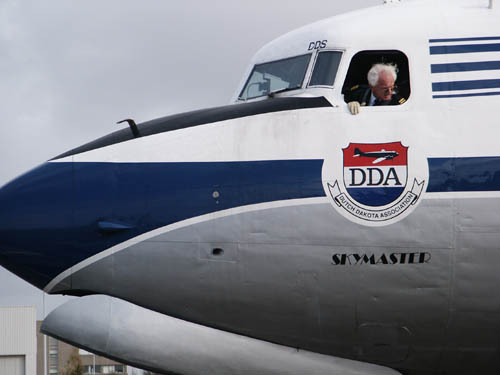 DC-4-1009 Skymaster (msn42934) of the Dutch Dakota Association started a new chapter in its long history: early November 2002 Springbok Flying Safaris "came to collect". Earlier that year the DDA had agreed upon a lease to the South African company. 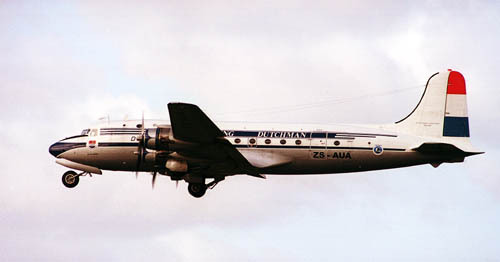 The Douglas factory delivered this Skymaster to South African Airways on 25Mar46 and SAA named it "Tefelberg"; ZS-AUA was assigned as the registration. It went to the South African Air Force in January 1966 with tailnumber 6901; it served with No.44 squadron. 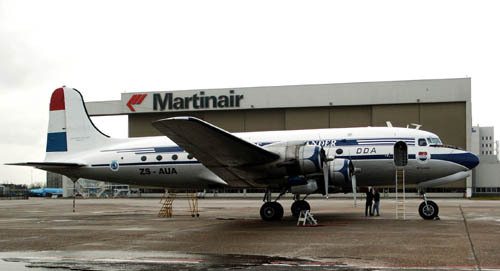 It was leased again by SAA but retired by the military in 1970. Aero Air (Pty) Ltd purchased it and reregistered it as ZS-NUR on 17Aug95. That same year it was bought by the DDA from Amsterdam, the Netherlands. 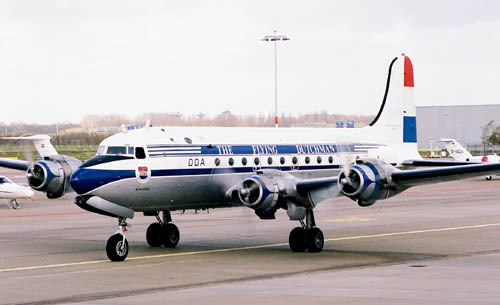 The long ferry flight was undertaken in 1996, arriving at Amsterdam's Int'l Airport Schiphol on 05May96. 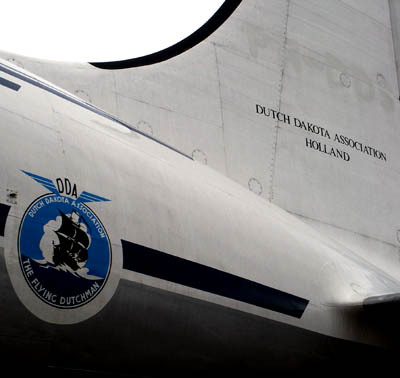 The DDA ran into difficulties with the Dutch Aviation Authorities, when the latter proved rather rigid while implementing new rules and regulations for companies flying with historical aircraft in the Netherlands. 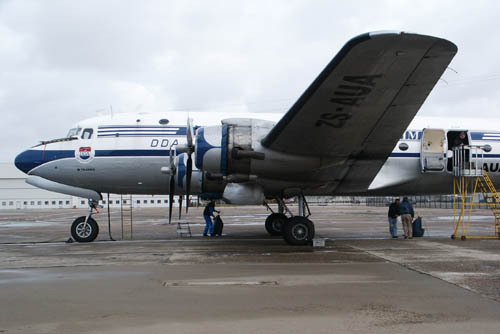 The DDA could not economically exploit the DC-4 under these strict rules and decided to sell or lease the DC-4. PH-DDS was removed from the Dutch register on 14Mar02. A great waste to see this unique aircraft disappear from the Dutch skies and in november 2002 that moment had come. 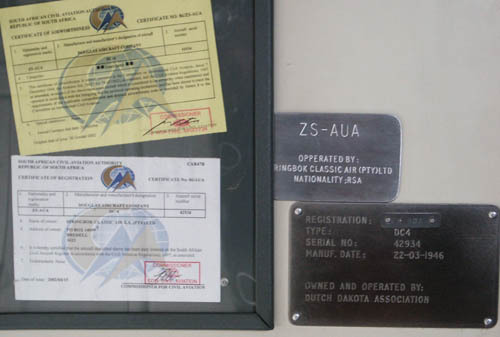 Former PH-DDS has been assigned ZS-AUA registration, which was applied to the aircraft on 01Nov2002 by the "Springbok" team. On a wind-swept Saturday morning, Nov.03rd 2002, ZS-AUA is seen awaiting the crew for a flight to Mönchengladbach (MGL / EDLN). 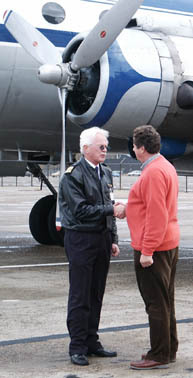 Its new owner, Flippie Vermeulen (Managing Director of Springbok Flying Safaris) is the commander of the flight. 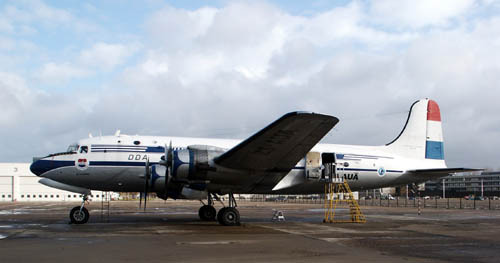 The DC-4 will remain in Germany till March 2003, while paying passengers are being sought for the flight to South Africa. 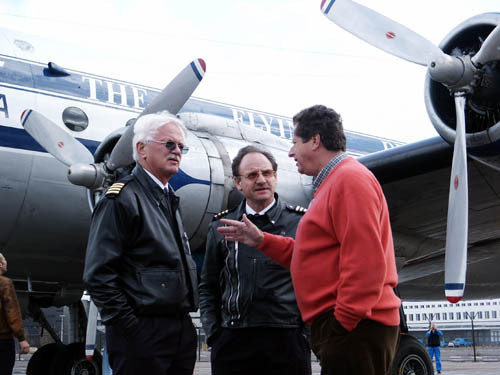 Anne Cor Groeneveld (CEO of the Dutch Dakota Association, on the right) had come to Amsterdam Int'l Airport (home of the DDA) to see Flippie Vermeulen (left) off and wish him and his crew "godspeed". 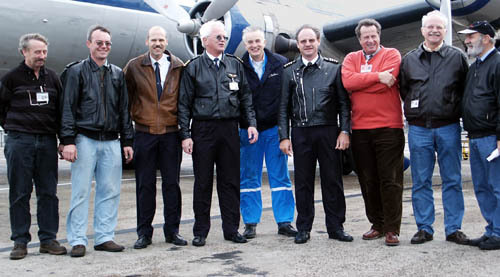 From left to right: Wim Heemskerk (DDA), Pierre Kok (SFS, DC3 and DC-4 technician), Jaap Eelman (DDA, DC-4 Fleng & 747 pilot), Flippie Vermeulen (SFS, Commander ZS-AUA), Leo van Heyningen (DDA), Johann van den Berg (SFS, Co-pilot ZS-AUA and co-owner SFS, qualified on DC-3,DC-4 and DC-6), A.C.Groeneveld (CEO DDA), Gerhard Westerdijk (DDA pilot, ex F-104 pilot), , Paul Althoff (German Touroperatoragent for SFS). "PH-DDS" can still vaguely be seen on the tailfin. The DDA markings will be removed after its arrival next year in S.Africa and it will get a complete new livery for Springbok Flying Safaris. F.Vermeulen and A.C.Groeneveld shake hands on the future. It is official, the constructionplate shows Springbok Classic Air. In time the plate for the DDA will be removed. Part of the pre-flight.... the wind made it hard for Jaap Eelman to stay on the wing ! Everybody helps a hand in getting ZS-AUA ready for departure. Captain Flippie Vermeulen keeps an eye on things going on around his aircraft; must be quite a change from his cockpitseat in one of SAA/SAL's jetliners every time he straps himself into the cockpitseat of a propliner ! And there she goes, taxiing for take off on runway 22, destination Mönchengladbach. 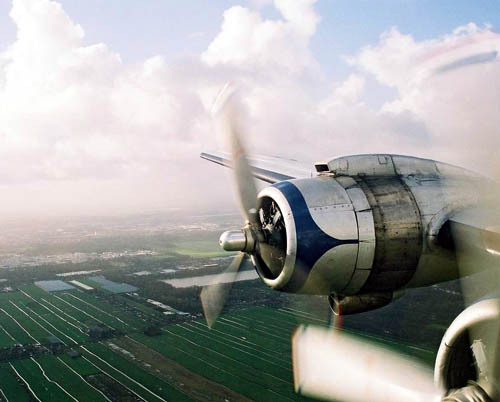 With grace, the DC-4 is climbing gradually after take off and somewhat in slow motion the gear is seen retracting. Will we see her return someday to Schiphol ? A photo taken while flying over the Netherlands (route: SPL-Vinkenveen-Eindhoven-MGL), kindly provided to me by Michael Prophet; he also provided me with the following inflight details: Flighttime: 45mins, Cruising speed: 170 knots, Cruising altitude: 1.000 ft, Engine settings (cruise): 30 inch manifold pressure at 2.000 rpm. 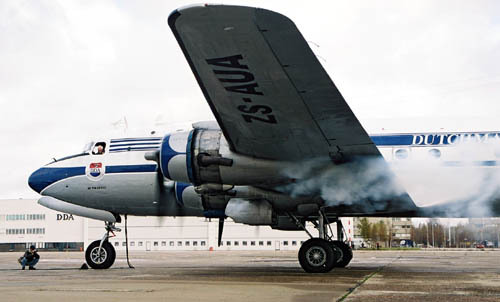 I came across ZS-AUA in South Africa, at Johannesburg-Rand in April 2004.
calling themselves Flying Dutchmen Foundation. 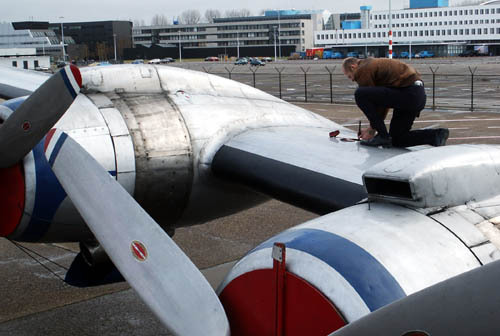 They hope to have the plane flying again in 2016! This was reported in December (2013) by DDA's chairman Feye Jaski to all DDA volunteers and staff. Jens Klank was given the opportunity to visit ZS-AUA at Mönchengladbach and has 36 pics on his website to show for it.